Greenday has been around for a long time, putting out studio albums since 1990. 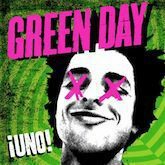 On September 24, 2012 they released their ninth studio album, Uno!. The album is the first of a trilogy, which will feature two other albums aptly named Dos! and Tre!. The albums will be released every two months: Dos! is set to release on November 13, 2012, and Tre! on January 15, 2013. Uno! and the rest of the trilogy were produced as a result of many months spent in the studio, from February to June of 2012, according to Rolling Stone, who published an extensive interview with the band in June. The band spent the first months writing and rehearsing a huge number of songs, recording them as the months went on. In total the group produced 38 songs. While the band originally debated between a single and a double album, they eventually agreed to release three albums. Each album will feature a different bandmate’s face on the cover. The band also released a promotional single from the album, “Nuclear Family,” via their YouTube channel. The album has received primarily favorable reviews to this point.